Beginning in 1998, Horse Island Camp runs for 10-11 weeks, the duration of school summer vacation. 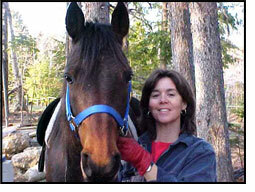 There are several reasons why I decided to run the horse camp; one in particular was that I have always loved horses. As a child I would long for an opportunity to be around horses, and living on an island I could count the opportunities on one hand. I was one of nine children so I’m sure finding a stable and paying the riding fees was not one of my mom’s top priorities. The feelings all came rushing back when my daughter’s Brownie Troop began taking riding lessons to earn a badge. I thought too bad this is just for a limited time….Or would it?! Phudra, the lesson horse my daughter was riding was for sale. In 1996 we bought her and then we acquired Mercury from Scarborough Downs. I moved back to Peaks Island and bought the same house I grew up in and decided to run the Horse Island Camp. The island was the place I always wanted to have a horse, especially as a child. In 1998 the Horse Island Camp, originally The Island Recreation and Horse Camp, opened. Enrollment started with six children and three horses, two able to be ridden. I kept looking for more ways to grow the camp so more children could participate but to maintain my very basic theory of safe, active fun! We are currently working with eight and a half horses and approximately three groups of ten children each. Daily crafts and kayaking twice a week have been added. I have tried to incorporate the things I have needed as a parent of four and the camp has been a nice way to spend more time with them as well as teaching others.